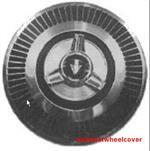 3270, Hubcap used, 15", 53-55, CHEVY, CORVETTE, RIB TYPE WITH SPINNER. 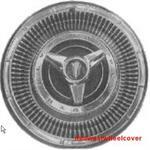 561, Hubcap used, 13", 65, PLYMOUTH, BARRACUDA, VALIANT, RIB TYPE WITH SPINNER. B-9, Hubcap, used, 14", 64, BUICK, SPECIAL, SKYLARK, MACHINED OUTER PART, POLISHED, WITH BLACK POCKETS, RIB TYPE, WITH 2 BAR CHROME SPINNER., BLACK LOGO, METAL CLIPS.